Admission Process On the basis of merit. No entrance required. Narsee Monjee Institute of Management Studies (NMIMS) was established in 1981 by Shri Vile Parle Kelavani Mandal. It was declared a ‘deemed-to-be university’ under section 3 of the UGC Act 1956 in 2003. NMIMS features among the top 10 B-schools of the country. Though it began as a Business school but it expanded to become a multi- disciplinary university with eleven constituent schools including Management, Engineering, Pharmacy, Architecture, Commerce, Economics, Law, Science, Aviation, Institute of Intellectual Property Studies & Distance Learning. The NMIMS Distance MBA program is one of the flagship programs of the university. At present, the university has more than 12000 students and 450 full-time faculty members. The distance programme has 7 regional Centres across the country including Mumbai, Delhi, Bangalore, Pune, Kolkata, Ahmedabad and Hyderabad. The institute provides Constant Academic Support from University Coordinators across locations with over 200 Touch Points during the program. It provides Excellent and up-to-date Student Learning Material developed by some of the leading publishers globally for its students and it also provides well defined Online Query Resolution process for students to connect with the faculty and get their doubts clarified. Graduates placed in top companies like American Express, Accenture, IBM and more. NMIMS is recognized by the University Grants Commission- Distance Education Bureau as well as by AICTE. 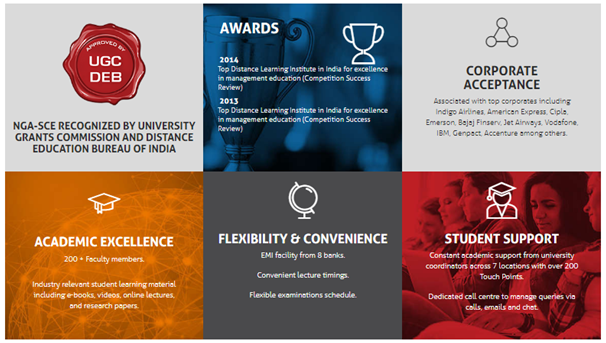 TOP DISTANCE LEARNING INSTITUTE IN INDIA- for excellence in management education by COMPETITION SUCCESS REVIEW in 2014 and 2013. RANKED 2ND AMONG TOP 10 B-SCHOOLS offering Distance Education by Zee Business in 2012. Ranked 5th in top distance learning Institute in India by DNA – INDUS LEARNING SURVEY in 2012. Candidates need to Fill up the Registration Form online and pay an Admission Processing fee of Rs 1,200/-. NGA-SCE has appointed Authorized Enrolment Partners (AEP) across the country. 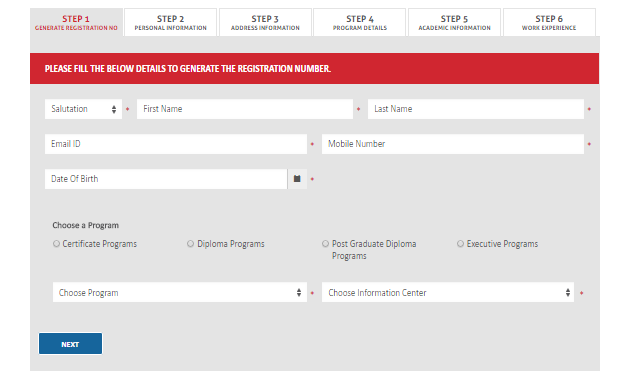 The services provided by the Authorized Enrolment Partner include scanning and uploading of eligibility documents on the University Portal, follow up and coordination between University and students (if required). It is to be noted that they are not authorized any program involving teaching processes, examination, assessment and academic counselling. These functions/programs are handled by the university only. Candidates need to pay the program fee on receiving approval of documents submitted by the University. Offline Candidates can also pay offline by issuing a Demand Draft in favour of ‘SVKM’s NMIMS’ payable at Mumbai. It is important to note that EMI Facility (3, 6, 9, 12 months) is available via online payment using credit cards of the following banks: HDFC, ICICI, Axis, CITI, Standard Chartered, HSBC, SBI, Kotak Mahindra Bank. The admission of the candidate will be confirmed and a student number will be issued after the approval of documents and the payment from the University. For 2018, The last date for applying without the late fees is 12th February, 2018 while the last date for applying with late fees is 14th March, 2018. In addition, Students need to pay the examination fee of Rs 600/- per subject and PCP fee of Rs 250/- per subject. The university offers no such scholarships for the purpose of distance education. Post Graduate Diploma Program Bachelor’s Degree in any discipline from any recognized University or equivalent degree recognized by Association of Indian Universities (AIU) with minimum 50% marks at Graduation Level. Bachelor’s Degree in any discipline from any recognized University or equivalent degree recognized by Association of Indian Universities (AIU) with less than 50% at Graduation level and minimum 2 years of work experience. Diploma Program Bachelor’s Degree in any discipline from recognized University or equivalent degree recognized by AIU. Higher secondary certificate exam plus 2 years of work experience. Secondary school certificate plus 3 years of Diploma recognized by AICTE and 2 years of work experience. Certificate / Advanced Certificate Program Bachelor’s Degree in any discipline from recognized University or equivalent degree recognized by AIU. Secondary school certificate plus 2 years of work experience. Executive Program Bachelor’s Degree in any discipline from recognized University or equivalent degree recognized by AIU. On the official page, students can enter their details and the university will directly get in touch with the candidates via email or phone. Emerson Network Power (I) Ltd.